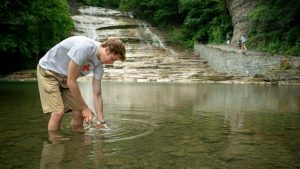 Ruth Richardson Ph.D., an Associate Professor of civil and environmental engineering at Cornell, is working with Biomeme to develop a new water monitoring technology that could significantly reduce the time that swim areas must close when water is suspected of being unswimmable due to bacteria levels. This approach to testing could lower the time to result for beach water tests from 24-30 hours down to 90 minutes or less. This improvement will allow for better monitoring of biological water quality. In addition, having fast accurate results can allow for real-time safety measures to be taken. Richardson was also interviewed by NPR affiliate WAER’s Scott Willis about her work. For the full interview visit WAER’s website. To learn more about the project read this article from the Cornell Chronicle.